When you have problems with your home’s air conditioner, heat pump or any HVAC equipment, Weather Master Heating & Air Conditioning is the HVAC contractor Raleigh, NC residents can turn to for quality service at a fair price. We have been serving the Raleigh area since 1977 and our skilled HVAC technicians are properly trained and able to fix air conditioners, heat pumps, furnaces, ductless mini-splits, and residential heating & cooling systems of all makes and models. We are available anytime with 24 hour emergency air conditioning repair and our AC techs are armed with the latest tools and training to properly diagnose and repair any issues with your air conditioner. 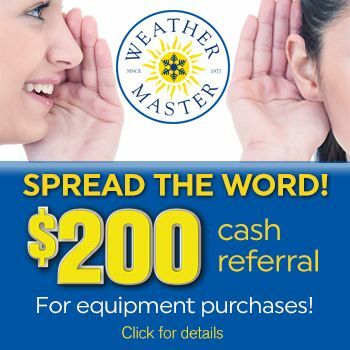 With the ability to repair all makes and models of air conditioners, heat pumps and cooling systems, Weather Master’s HVAC technicians are ready to help when your AC goes out on a hot summer day. We provide 24 hour emergency AC repair and will work hard to get your system repaired promptly and at a fair price. We have been keeping Raleigh, NC area homeowners cool and comfortable since 1977 and we are committed to providing our customers with 100% satisfaction. We believe in excellence in all areas and make it our job to earn your trust. WHY CHOOSE US FOR YOUR AC REPAIR NEEDS? It’s important to keep your home’s air conditioning system serviced on a regular basis to help improve its efficiency and life expectancy. After reviewing hundreds of service calls, we discovered that over 53% of these repairs could have been avoided with regular AC system maintenance. So we developed a comprehensive AC tune-up package that reduces expensive air conditioning repairs and increases your AC system’s efficiency, saving you money. Learn more about out AC system tune-up service. Weather Master Heating & Air Conditioning is your local expert for installing Lennox high efficiency air conditioning systems. When it’s time for a new AC system in your Raleigh area home, one of our Comfort Specialists will evaluate your home, comfort preferences, and budget to determine which air conditioner is the best match for your home and lifestyle. As a Lennox Premier Dealer, you can rest assured you are getting the most reliable and efficient air conditioner backed by Weather Master’s decades of home cooling expertise. Learn more about Lennox air conditioners that we offer. From regular maintenance to quick repairs and new installations, Weather Master Heating & Air Conditioning is the company to call when you need a professional air conditioning contractor. Give us a call or schedule AC service online.